It’s the motto of my book Queen of the Vatican. Difficult to translate in English, but it would be something like ‘coincidence doesn’t exist, it just comes to you’. Last weekend I was in Berlin, and I thought it was just for a holiday. No Matilda for awhile. I wanted to visit the Museum Insel, to see the Sumerian and Etruscan art, a long-standing wish. But then the dreaming started. And those of you who have read my book will understand that the big things in my life usually start with big dreams. First night in Berlin: I dream that Berlin contains seven pearls, that I have to discover in the three days of my stay there. Waking up I remember that the string of pearls is important in my story of Matilda di Canossa. But where is the link? I had to discover it. Then, on the first day I visit the Pergamon Museum. In complete amazement I am walking through the Gate of Ishtar that’s standing here since more than a century. It radiates an incredible energy. And not only that, I am immediately impressed by the huge lions on the gate and on the Avenue leading towards it. Just read the last chapter of ‘Queen of the Vatican’ and you will understand my amazement: two days before initiating the heart labyrinth in Canossa a similar gate appeared to me in a dream. I interpreted it as a gate towards a new era, prophesied by the makers of her tomb in the Vatican. Now, in the Berlin Museum, I walk through this gate, and it is as if an invisible thread between Babylon, Canossa and Berlin is unfolding. Then, in the three hours spent in the Museums I unexpectedly come face to with several statues of ancient goddesses that I have been writing and lecturing about but never saw in reality: Inanna, Turan, Menrva and more. They touch my heart. That night I dream that the Goddess herself tells me to make a leminiscate, a reclining 8, around the Museum Insel, and from there to distribute peace and abundance in a large area around. Eight is the number of transformation, and 2015 adds up to an 8… The pattern seems to repeat itself during and after a visit to the Ethnological Museum, with a beautiful department of Mexican art. Again I realize that the statues there not only have an enormous historic/aesthetic value but also radiate a very strong energy. I feel nearly blown away by some of them. 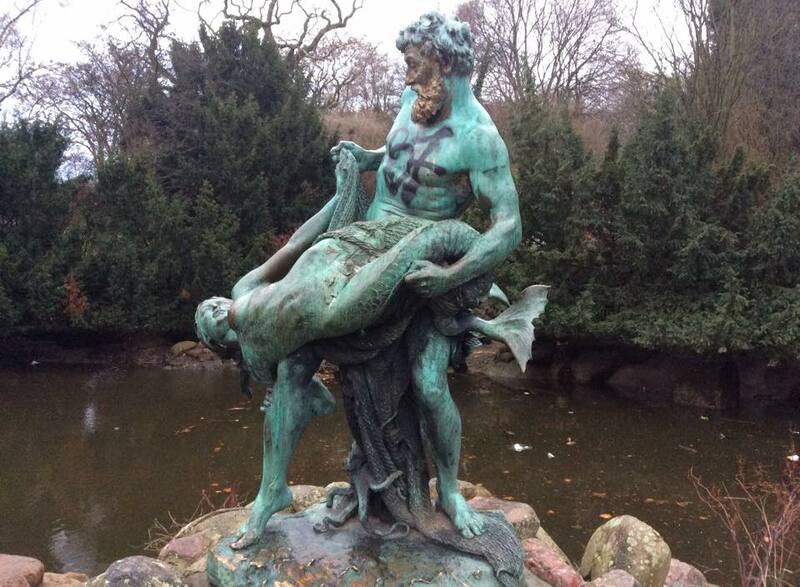 In between we discovered a statue of a very special double tailed mermaid in Victoria Park in Kreuzberg. She is pulled out of a pond by a funny God-like man. My intuition tells me that she stands on a strong crossing point of leylines, maybe even the omphalos of Berlin. After all I learned in Italy that this is a common place for mermaids, as representatives of ancient female creative powers. A quick internet search confirms my intuition. And then, back home in Amsterdam I receive a third dream: I see Ishtar’s gate rising up from a river in Berlin, on the tympanum there is a double tailed mermaid… So, what does this have to do with Matilda, you could ask? First of all, there is of course the similarity with my earlier dream. 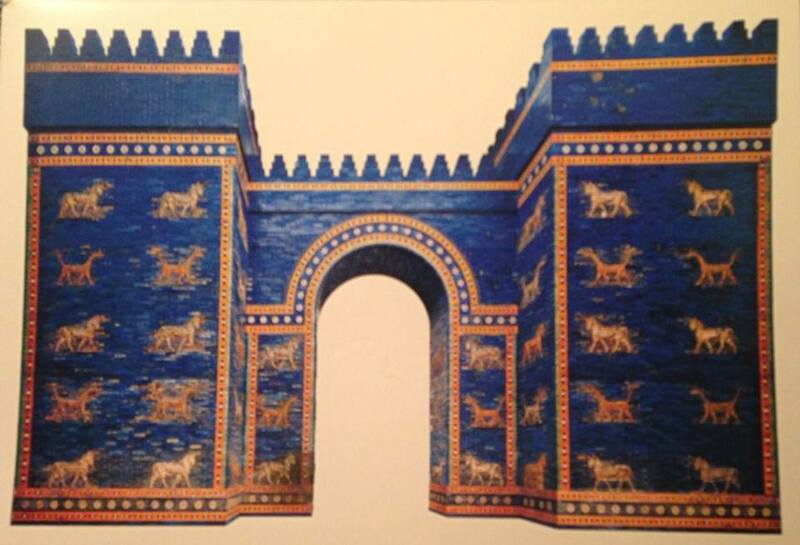 It made me understood (again) that the origins of the Lion Gate are in the ancient Goddess cultures. It confirms that what I saw in Canossa has to do with the return of the Feminine Divine. And then, I visited Berlin in the weekend after the Charlie Hebdo killings in Paris. At first I felt regret that I was locked off from the world news there. Until I realized that I had to be in the eye of the storm for receiving these powerful images and energies. For I am deeply convinced that more than ever we need a resurrection of the feminine divine now. And that’s what I saw in the last dream: She presented herself with a deeply impressive power. And it happened in Berlin, of all places…. More than ever we need dialogues and meeting places between the religions, aimed at enhancing mutual understanding. The feminine has to be unlocked for this to happen. And that’s the vision that unfolded for me during the past year in Canossa: Matilda’s castle as a new place of reconciliation and peace making: read the last chapter of my book. So. I couldn’t have had a better start of this year of commemorating Matilda than travelling to Berlin at this moment in history. My frien d and I celebrated this all in an Italian wine bar in Berlin, asking for a glass of good Italian wine. And then the owner spontanously poured us two glasses of Villa Matilde, Rocca dei Leoni, with an image of two lions next to a tower… So what else can I say than ‘Salute’, wishing all of us a year of abundance and of growth of mutual understanding, and of peace making in this turbulent world?